Shopping for a new Mercedes-Benz E Class? While the standard steel suspension is well-composed, the 2019 E-Class comes into its own with the optional air springs. The 2019 Mercedes-Benz E-Class is what we all want to be when we grow up. Smooth, suave, confident, versatile, and athletic, the 2019 E-Class lineup is the opposite of the class clown. In many ways, the E-Class is Benz at its best. The more-than-adequate E300 is an amazing starting point to a lineup of 4-, 6-, and 8-cylinder sedans, coupes, convertibles, and wagons with rear- or all-wheel drive that culminates in the ferocious but always civil AMG E63. This year, the E-Class range adds a new E450 mid-level model with a 362-horsepower twin-turbo V-6 and an AMG-tuned E53 with an inline-6 paired to a 48-volt electrical system good for 429 hp. Other updates for 2019 are minor such as a redesigned steering wheel and two new interior trim shades. The E300 sedan serves as the gateway to the lineup. At about $55,000, it’s costly for a 241-hp turbo-4, but we covet it nonetheless. Step up to the E450 and the lineup expands to include a sultry coupe, a boulevardier convertible, and a remarkably practical wagon. The Mercedes-AMG E53 tacks on more power for more money in sedan, coupe, and convertible guise. We haven’t driven one yet, but this new inline-6 earned our praise under the hood of the shapely CLS-Class sold alongside the E-Class. If that’s not enough, the AMG E63 sedan and—swoon—wagon deliver supercar-grade performance paired with a cosseting ride like no other new car. Much of the credit is due to the E63’s air springs, which are a worthwhile option on other E-Class cars. Inside, all versions share an elegant dashboard and most will leave dealer lots with a pair of 12.3-inch widescreen displays under a single glass panel. They serve as a configurable digital instrument cluster and an infotainment system that’s not Mercedes’ latest but is still easy enough to sort through. Stick with the E300 and you’re likely to find seats covered in hard-wearing synthetic leather, but various shades and grades of leather paired to wood and carbon fiber trims are available at the tick of an option box or three. Just open your wallet. Sedans and especially wagons are spacious, coupes and convertibles less so. Mercedes is more stingy about its most advanced safety gear than these prices suggest. Opting for about $2,300 worth of gear adds an advanced adaptive cruise control that brings Level 2 self-driving capability that can change lanes at the tap of a turn signal and can swerve out of the way of errant oncoming cars. It’s not hard to top $100,000, but the Mercedes E-Class is one of a handful of cars to feel worth every bit its asking price. It’s almost enough to make you wonder if the Benz S-Class is really worth the upgrade. Forget the days of blocky taxis; the 2019 Mercedes E-Class is a stunner in any form. With the 2019 E-Class, Mercedes reminds us that space needn’t take a back seat to style. In sedan, coupe, convertible, and wagon forms, the 2019 Mercedes-Benz E-Class has an attractive, balanced look. Sedans have a pleasantly bulbous look that echoes Mercedes’ more voluptuous designs of the past. Coupes and convertibles take a more dramatic approach with a roofline that drapes smoothly into their short trunk lids. 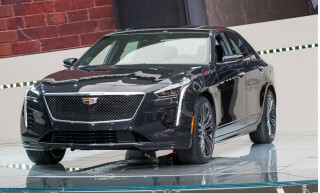 Designers didn’t skip the details, either, adding a pair of “power bulges” like those on the brand’s 1950s race cars to two-doors’ hoods and removing a character line along the sides that gives the sedans a comparatively formal look. The E-Class wagon, which might as well come standard with a sticker from a Greenwich prep school, pairs the sedan’s crisp profile with a longer roof and the coupes’ wide taillights. With myriad interior and exterior color combinations, wheel options, and a choice between standard “Luxury” and AMG styling kits, few E-Classes are likely to look like one another. We’ll have ours as an E450 wagon in a conservative blue with the optional (yes, really) hood ornament. Or maybe we’d rather have a red E63 coupe. Ah, choices. Inside, the E-Class carries over exterior design themes, except that all models share the same dashboard with round vents and big infotainment and gauge cluster screens taking up considerable real estate. Matte-finish trim comes standard and gives even the base E300 a designer look. The standard synthetic leather is convincing enough, but cars with optional leather can have matching hides with contrasting stitching draping their center consoles, door panels, and dashboards. Base models come with conventional gauges flanked by a 12.3-inch screen, but we imagine most E-Classes will be ordered instead with an additional screen instead of the oh-so-2009 analog cluster. Mercedes will outfit an E-Class’ interior in a wide variety of trims, upholsteries, and colors, so it’s worth spending some time picking out what’s just right. If the mid-size Mercedes is still a taxicab in your eyes, it’s time to thumb through those vivid hues. Every 2019 Mercedes E-Class boasts unflappable composure, but AMG models are ready to dance when a race track beckons. If there’s an E-Class bodystyle for every need, there’s also an engine. Base E300 coupes, convertibles, and sedans make use of a 2.0-liter turbo-4 that’s rated at 241 horsepower and 273 pound-feet of torque. Though an E300 with no options ticked still weighs around 4,000 pounds, the standard 9-speed automatic transmission makes passing effortless. Power surges on from the torque peak at just 1,300 rpm. The E300 comes standard with rear-wheel drive, but those in the Snow Belt will want to opt for the all-wheel-drive system that splits power 45/55 front to rear. Underneath, the multi-link independent suspension can be had in plush base or firmer sport tune while adaptive air dampers are a worthwhile option for a smooth, exceptionally well-controlled ride. The air dampers also lower the car for better aerodynamics at speed; at the tap of a button, the air springs raise the E-Class for steep driveways. An uprated 3.0-liter twin-turbo V-6 this year means a name change from E400 to E450 for coupes, convertibles, sedans, and wagons. Power’s up to 362 hp and 354 lb-ft of torque this year, and we’re not complaining. Even the heavy, highly optioned E450 wagon we drove made quick work of on-ramps, highway passing, and even around-town hustling. Comparatively lithe coupes should be even zippier. 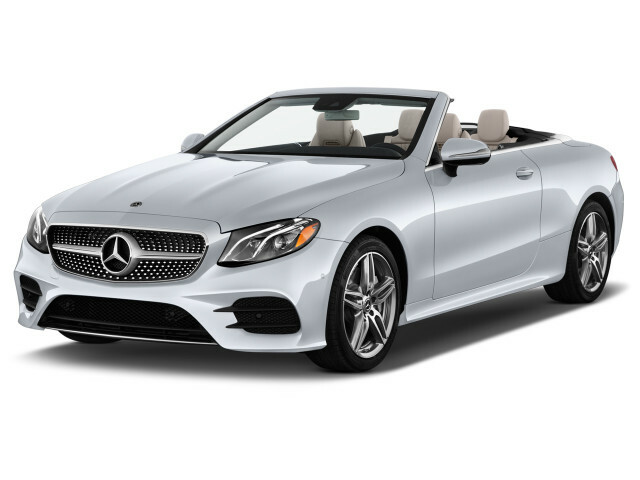 E450 coupes and convertibles come standard with rear-wheel drive and offer all-wheel drive as an option. Sedans and wagons with the twin-turbo V-6 are all-wheel-drive only. Regardless of where the power goes, it’s sent there via a 9-speed automatic that works as well with the V-6 as it does the E300’s turbo-4. There’s more than meets the eye with the E53. It might be easy to dismiss it as an AMG-lite because its 3.0-liter turbocharged inline-6 comes from Mercedes’ inventory of standard engines. However, it fires of 429 hp and 384 lb-ft of torque and features a 48-volt electric starter-generator squeezed in between the engine and transmission that can add 21 hp and 184 lb-ft of torque from a stop. The setup is designed to provide lag-free reaction to a mashed throttle pedal while reducing fuel consumption by letting the E53 run on electricity alone while cruising. 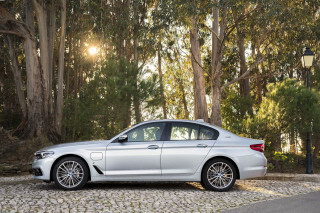 We’ve driven the E53 throughout Northern California in sedan, coupe, and convertible form and found the performance to be just as potent as a V-8, but with mild-hybrid fuel economy. In mixed conditions, the E53 returned nearly 30 mpg combined—highway speeds and stop-and-go slogs. The AMG-tuned turbo-6 spits overrun in delightfully pleasant ways, and there's plenty of power in reserve for highway passes. All AMG E 53 models are equipped with all-wheel drive and are tuned for street performance, not track days. Mercedes’ hot-rod E63 S can morph from executive express to track-tamer at the press of a button. Underhood, its twin-turbo 4.0-liter V-8 puts out 603 hp and 627 lb-ft of torque fed to all four wheels via a beefed-up 9-speed automatic. The modified all-wheel-drive system can shuttle every bit of that power rearward for hooliganing, something we highly recommend on a closed course in the E63 S wagon. Chunkier stabilizer bars and more suspension bracing pairs with upsized brakes all around. The nearly 16-inch brakes up front can be swapped out for carbon-ceramics as a costly option. Try before you buy as the standard brakes are easier to modulate in traffic. The E63 S goads drivers into going fast, but it’s remarkably docile loping along thanks to its air springs and adjustable dampers. The 2019 Mercedes-Benz E-Class is spacious and superbly finished, as it should be at these prices. 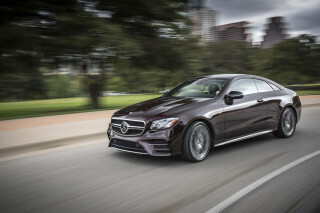 The 2019 Mercedes E-Class exceeds expectations when it comes to its comfort and quality. 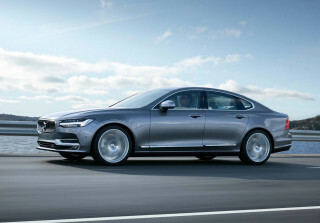 Expectations vary by bodystyle, of course: Wagons double as luxury apartments, two-doors are predictably tight for rear-seat riders, and sedans strike a healthy balance. Power-adjustable front seats are standard on all and they’re wrapped in synthetic leather as standard on all but the E63. What feels like real hide isn’t, unless you’re willing to spend up. Optional extras include heating, cooling, and massaging for the front seats—plus heated armrests and a steering wheel that temp up with a quickness. 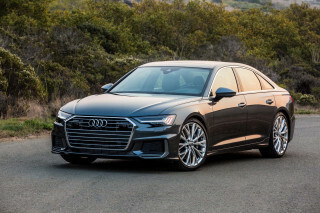 Rear-seat passengers are treated to a reasonable 36.2 inches of leg room in sedans and wagons, which have wide-opening doors and rooflines high enough to make sliding aboard a cinch for taller riders. Coupes and convertibles prove a challenge to snake into, but that’s the price to pay for style. Cargo varies by body. Sedans have just 13.1 cubic feet of cargo space in their trunks, a figure more akin to a subcompact sedan. Wagons are the hauling champs with 35 cubes behind the second row. The wagon’s standard rear-facing fold-out third-row bench seat can hold two kids, but it’s not sized for adults. Warm, sensual shapes flow from the 2019 E-Class’ dashboard onto its door panels and cascade down its center console. Base E300s come with natural-grain wood paneling that feels as good as it looks. Depending on what’s underhood, Mercedes offers various glossy and matte woods, intricate aluminum, lacquered piano finishes, and even carbon fiber. Materials are generally in line with prices, although hints of less costly plastic can be found on the lower door panels. Those bits don’t raise eyebrows at the $55,000 cost of entry, but they might on an E63 S that commands double that. If the standard Mercedes E-Class isn’t quiet enough, a $1,100 Acoustic Comfort package adds more insulation and thicker glass. Plan to spend considerable time sorting through the various upholstery, panel, headliner, and seat types available before ordering a Benz E-Class. It’ll pay off. The 2019 Mercedes-Benz E-Class aces its safety evaluation. The 2019 E-Class starts with a good complement of standard passive and active safety gear. All E-Class cars come with forward-collision warnings with automatic emergency braking, a driver-attention monitor, and a rearview camera. For about $2,300 on most E-Class cars, the Driver Assistance Package adds Level 2 self-driving tech that can keep the E-Class in its lane and away from cars in front. A tap of the turn signal and an E-Class with the option package looks for an opening in traffic and will switch lanes on its own. Mercedes brands its tech as Drive Pilot, and while it’s not intended for full hands-off driving, it makes a good fatigue reducer on roadtrips. The package also includes adaptive cruise control. If that all sounds like too much tech, blind-spot monitors are available on their own for $500. Rear side-impact airbags built into the seats and airbags integrated into the rear seatbelts cost $650 on sedans and wagons, too. The NHTSA has not yet released its ratings for the 2019 E-Class, but last year’s model earned five stars in every test and a five-star overall rating. We see little reason why the 2019 model won’t earn those same scores. The 2019 Mercedes-Benz E-Class wants for little and can be outfitted decadently, with a price to match. True, you can buy a 2019 Mercedes-Benz E-Class without taking advantage of the myriad extra-cost options and packages available. You can also walk into Bed Bath & Beyond without a stack of 20-percent off coupons, but you probably shouldn’t. If only Mercedes-Benz dealers sent coupons in the mail. The E-Class starts at about $55,000 in 2019 E300 guise. All-wheel drive costs $2,500 extra, but good luck finding an E300 without it where snowfall is a common occurrence. The base E300 includes a 12.3-inch display for its infotainment system, synthetic leather upholstery, navigation, Apple CarPlay compatibility, power-adjustable front seats with memory, and a pair of USB ports. Here’s where we’d start: Add $3,150, the Premium Package adds Burmester audio, keyless ignition, heated front seats, blind-spot monitors, and a wireless charging pad. Grab the advanced active safety tech that makes the E300 a Level 2 self-driving car for $2,250. We’d also strongly consider the $1,900 air suspension and a $1,050 package that adds heated front armrests and a heated steering wheel. Decadent optional extras that depend on last year’s bonus include $5,450 worth of upgraded Burmester audio, $1,320 for massaging front seats, $1,100 for more sound insulation, $850 for a digital instrument cluster, and $4,900 for nappa leather. The E450 sedan seems like a comparative value at about $61,000 with standard all-wheel drive. The Mercedes-AMG E53 costs about $13,000 more, while the E63 S rings up at about $106,000. 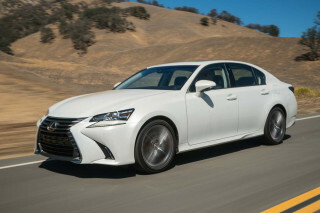 Coupes cost about $2,000 more than equivalent sedans and convertibles bump that figure by another $7,000, although they’re only available in E450 and E53 guise. Notably, leather upholstery is optional. The E450 wagon starts at about $65,000 and is high on our list of cars we’d happily drive forever. The 2019 Mercedes-Benz E-Class is fairly efficient given its powerful engines, but some rivals are more frugal. The base E300 with rear-wheel drive would eke out a 5 out of 10 thanks to its EPA ratings of 21 mpg city, 30 highway, 25 combined. Add all-wheel drive and the E300’s fuel economy dips to 21/29/24 mpg. Those figures aren’t great compared to the 27-mpg combined rating for the BMW 530i, but they’re on par with the Audi A6’s 25 mpg combined. E450s hover around 22 to 23 mpg combined depending on bodystyle and drive wheels; wagons and convertibles weigh more and are slightly less frugal than their sedan and coupe counterparts. The Mercedes-AMG E53’s 48-volt mild-hybrid system pays off in a combined rating of 24 mpg rating for sedans and 23 mpg combined for coupes and convertibles. E63s are rated at 18 mpg combined in sedan form and 19 mpg combined as a wagon. Given their supercar-level performance, that’s not too bad.